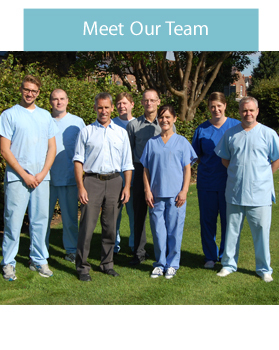 Mark began his career on a six month Government Youth Training Scheme, at Brooklands Dental Laboratory in 1980. When the laboratory was based in Brooklands, Sale. At the end of the scheme he was offered a full apprenticeship, which as well as working hands on in the laboratory, attending Manchester Polytechnic on a day release basis to study for a BTEC Diploma in dental technology. After completing his BTEC in 1985, Mark continued his education for a further 2 years, again on a day release basis gaining an HNC in dental technology. Mark eventually became a partner in the business and took on the shares of the other partners as they retired from the business. Currently the laboratory is now solely owned by Mark Greaves. Mark has worked at Brooklands since July 1996. With over 30 year’s experience in prosthetics he has excellent technical knowledge. So if you have any technical questions or need any specific prosthetic advice then Mark is an excellent man to ask. John is the friendly voice on the telephone, when you contact the lab. He looks after the administration of the work, answering queries, checking dates of work etc. If you have a technical question he will be able to put you through to the right person who can answer your query. John has worked at Brooklands since 1998, originally joining the team as a driver. He is a keen mountain biker and cycles to and from work each day, ensuring he is the team member who least contributes to global warming! Paul has been at Brooklands since August 2005 and he has over 30 year’s experience within the industry. He gained his city and guilds qualification at The John Dalton Faculty of Technology, Manchester Polytechnic in 1981. Outside work Paul is a dedicated snooker player and plays competitively. Donna served as an apprentice before qualifying as a dental technician and she originally specialised in crown and bridge as a ceramist. Donna joined Brooklands in February 2009 in order to change her pathway in the industry and has embraced the challenges of prosthetics. Jacqueline originally started with Brooklands as an apprentice, after leaving school and gained her foundation degree in dental technology on day release at Manchester Metropolitan University. She then moved to the Dental Hospital for a couple of years gaining further experience before returning to Brooklands in January 2012. Paul has been involved in the dental industry since leaving school, and has been part of the Brooklands team since March 2008. He has had a varied career within the industry, working at Withington Hospital within the maxillo-facial unit as a prosthetic technician for a number of years, before inventing The Aqua Forma Machine. This was a multiple was coping fabrication system which is used in crown and bridge sub-structures. For many years he was busy with the marketing and of this item and demonstrated it worldwide, before selling it to an American company.